After years of thoughtful planning and construction, Gonzaga University's 167,726-square-foot John J. Hemmingson Center has been completed, and move-in is underway. The official dedication of the facility is set for Oct. 16 during Gonzaga's second 'Zagapalooza' All-Zag Reunion weekend Oct. 15-18. The campus community is eager to experience the transformative impact the new living and learning environment presents. Located in the heart of Gonzaga's campus, the Hemmingson Center brings the community together, blending the core elements of the Gonzaga experience - academics, student development, faith, and global impact - in a facility designed for connectivity. It is the new home of University Ministry, Center for Global Engagement, and a variety of student development programs, including Student Involvement & Leadership, Center for Community Action and Service Learning, Unity Multicultural Education Center, and outdoor programs, as well as student activities and clubs. "Students, and the student experience, have been at the forefront of this building's plan from its earliest stages," said Thayne McCulloh, University president. "What has been created is a place for our students to learn, reflect, engage, play, and grow." It is also a place for the campus community to meet and gather with a variety of conference rooms, movable workspaces, informal gathering places, and a 900-seat multipurpose space. The Center's two-story dining room will host resident dining for students living on campus with six specialty food platforms, while themed eateries, a grab-and-go marketplace, and conference dining will provide food services for the campus. The new Center reflects the University's commitment to sustainability. Aiming for Gold LEED certification, the Hemmingson Center was designed with the environment in mind using environmentally sensitive design, construction and operational plans. The building will use geothermal heating and cooling, and features both a hydroponic greenhouse for fresh produce and an apiary serving as an educational tool for the campus community. "The construction team has worked tirelessly throughout this project," said President McCulloh, "and the mild winter helped the project move forward on schedule. We're really looking forward to seeing it come to life this fall when students, faculty, staff, and alumni return." David Shourd, project manager for Hoffman Construction, Portland, Ore., general contractor for the facility, says the project presented challenges, but has moved forward smoothly: "We have been impressed with Gonzaga's attention to detail, and the efforts of the University to capture every opportunity to use the building to educate and engage those who visit. It's a great addition to Gonzaga's campus." For the past several months, there have been between 110 and 130 workers on site on a daily basis with more than 270,000 work-hours invested in the project by 48 subcontractors, most of which are Spokane-based. Construction costs total $51,560,000. Total project cost, including architectural services, furnishings, etc., is $60 million. 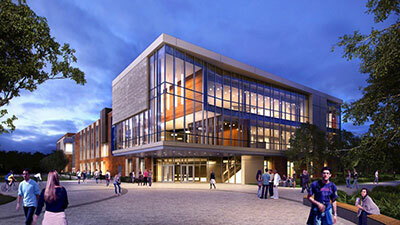 The John J. Hemmingson Center is named for the lead benefactor, a member of Gonzaga's Board of Trustees, whose $25 million donation made the facility, and related campus developments possible. The project, announced in January 2013 at Gonzaga's first National Gonzaga Day, will be dedicated at 4 pm on Friday, Oct. 16. For more information, visit the Hemmingson Center website www.gonzaga.edu/hemmingsoncenter.